That's our little one. She likes to joke a lot. When I went to the ophthalmologist for the first time, she cracked a lot of jokes to the patients who were in the waiting room with us. And she was a big HIT to them. They even asked her to stay with them when I went in for my turn...LOL. When we asked her what she wanted for her birthday, we were not not surprised at all when she readily said: a big fat JOKE BOOK! Dad looked for the big fat joke book online but there's no big fat joke book...they're all thin books. So we got her several joke books instead. She already read [and used] almost all of the jokes in her books. Btw, the one an the bottom of the picture is not a book. 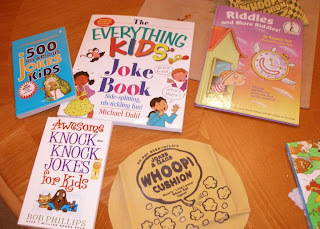 It's the 'whoopie' cushion that I wasn't aware of until the Dad got it for her as well. It's a 'farting' cushion!!! It's now broken because it's overused. Can you imagine how much 'fart sounds' I had to endure in the last few days???? that is funny. how quick was it for that farting cushion to break? ang bilis naman.